It’s a dark world, so very dark. With deep mythologies and strange unseen powers at play. Who can be brought into the cult? Who can be offered as a sacrifice? Who will take charge? 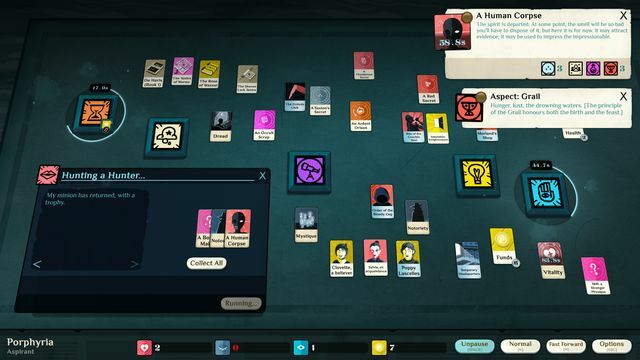 In Cultist Simulator, the answer is you. The latest release from writer Alexis Kennedy who brought us Fallen London and Sunless Sea via his own company, Failbetter Games, allows players to take on the role of an ordinary person, someone who is concerned with paying the bills and having a career but whose ultimate objective is to tap into the dark, magical and mythical world beneath. Exciting no? Unfortunately not. 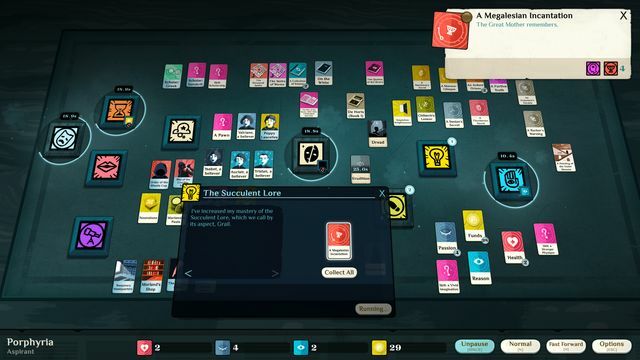 This game and premise could have made an enthralling RPG but the direction they decided to go in was in the form of a timed card game. Instantly this felt like a game better suited to mobile gaming than PC. 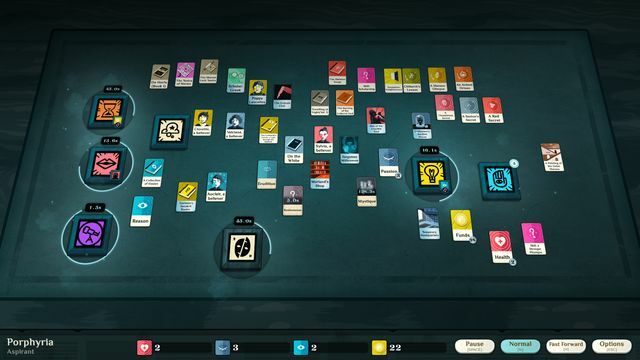 From the first moment the player sees the overhead view of the card table onto which they can place their cards. Each spot capable of taking cards is given an overarching name; Work, Time, Explore, Talk, Study and Dream. Once a card is placed the issue of the timer becomes more imperative. As it ticks its way down you must play other cards in conjunction with the original to bring about different effects and storylines. 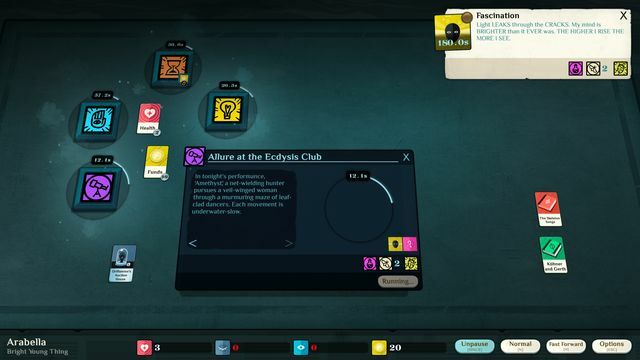 By studying you are able to gain knowledge of the occult from your vast library, by working you earn money, by talking you interact with other characters; be they followers, potential followers or intrusive investigators, by exploring you can travel to other locations and discover their secrets for use later in the game and dreaming allows you to understand the game more completely. This all sounds enthralling and I must admit that on the first couple of playthroughs I was taken in by the immersive and deep nature of the mythology and the potential actions playable. The timer system works well to keep the game’s pace however the novelty did wear thin. Once you understand how to progress through the myriad of options you will find that new paths present themselves, this includes when you inevitably lose the game you will be given a different career option for your work which will change the direction and characters in the story. 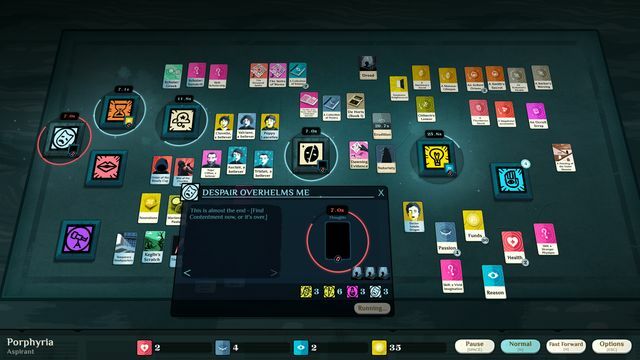 This has been well modelled and does add to the replay value of the game. I do have a slight issue with the length of time it takes for a playthrough though. Generally games can last as long as 3 hours which for games like civilisation simulations makes sense and keeps you interested through constantly moving about and making decisions. 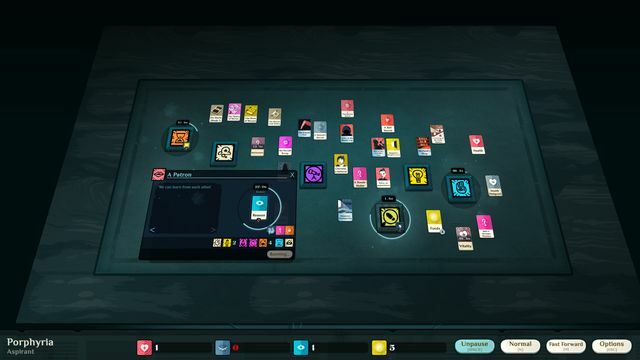 Though decision making is present in Cultist Simulator I found the card based nature of the game to become tiresome; had I not been reviewing the game I doubt whether I’d have given each play as much time as I did. The game itself is excellently written. It has an engaging story and characters with a far deeper world mythology than I was expecting, one far more detailed than I have seen in many traditional RPGs. 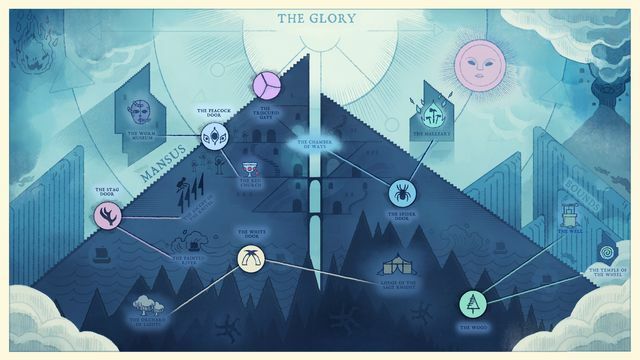 Kennedy has excelled himself with the amount of information and intrigue he has been able to conjure with only a tabletop setting but again I can’t help but feel that this amount of creativity and lore is perhaps wasted on such a static game. 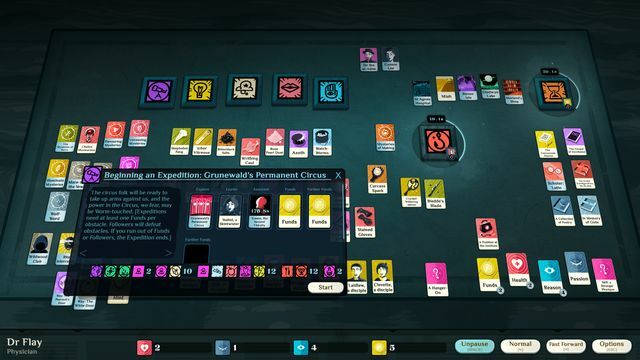 The idea of mixing together different combinations to achieve different outcomes does create a plethora of different possible storylines and it is fun to do this as you make your way through the various iterations of the game you will play. For me, this was enjoyable but again its charm did wear off rather quickly. It reminded me immediately and throughout of an older Android/iOS game called ‘Alchemy’ where you would combine elements to form new elements until you were able to create life and on to society. Though each time you played you may have a different route to the eventual goal, the combining of elements became less tactical and more random. 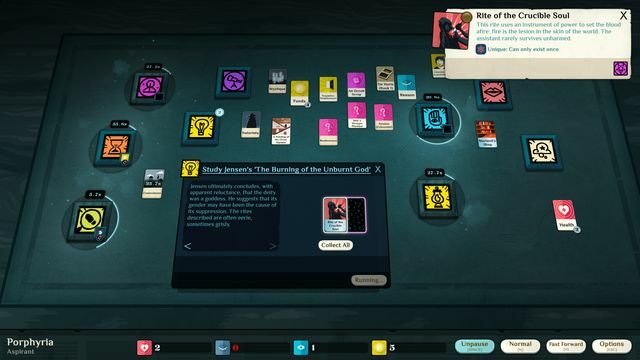 I found myself doing this with Cultist Simulator; the more I played the less I actually cared about the intricacies of the card text or the planning behind what I was going to play and the more I played the most ludicrous combinations I could find to see what would happen. To the game’s credit not once did I manage to stump it! There is no voice acting in the game but ultimately it doesn’t need it, it works without this thanks to the brilliant writing. I didn’t expect there to be much in the way of graphics to speak of and I was correct. 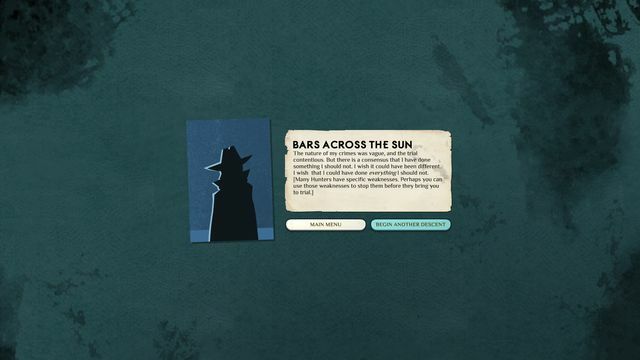 This is a game from the old school, a game that put me in mind of Zork where the story is more important than the look or feel and the decisions you make can branch off in unexpected directions. Overall, Cultist Simulator is a decent game. It is one that will become an obsession for many people who enjoy this kind of mixing and matching against the backdrop of an occultist cult. The card game theme is one that will certainly appeal to many and for this kind of game it is done very well. My main complaints are that with a story as engaging, a mythology so deep and an objective so brilliantly sinister this could have been a superb and fully rounded SRPG. It could have been something so brilliant and yet the gameplay premise just left me lamenting what it could have been rather than enjoying what it is. If you love strategic card games then there is a lot to like here, but if you’re like me, the game will become fairly stale fairly quickly. 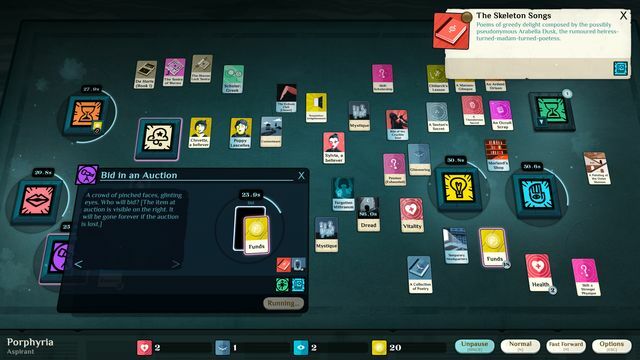 Cultist Simulator was reviewed using a digital code supplied by the publisher.